One series we’ve been tracking for quite some time now (but not since June) is the market’s implied inflation expectations in the United States. Essentially, when you subtract the yield on inflation adjusted instruments from the Treasury (which will track the CPI) from the yields on non protected securities, you’re polling the market on what it expects inflation to be, annualized, over the term of the securities. 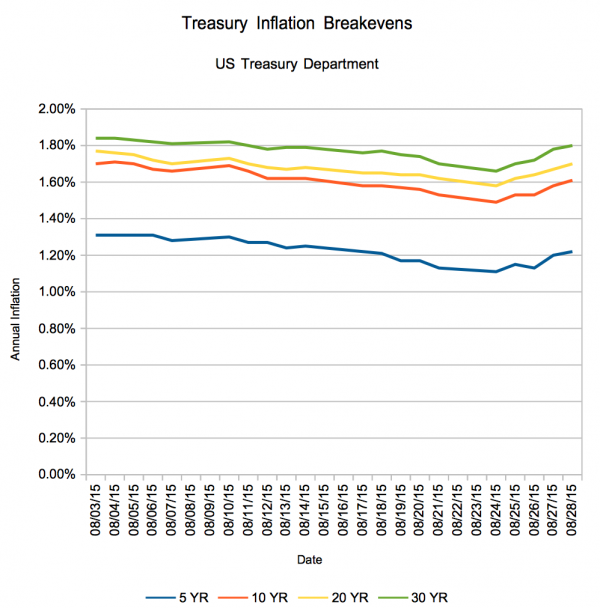 These numbers, so-called “inflation breakevens”, are a great gauge of the market’s inflation expectations which you can take on any day you’ve got Treasury data. (Of course, its not always that simple – there are some factors which introduce noise into the math such as tax treatments, so there are superior models as well). Anyway, you’re probably interested in seeing how expectations have changed in August due to the increases in volatility in the market. Here you go! 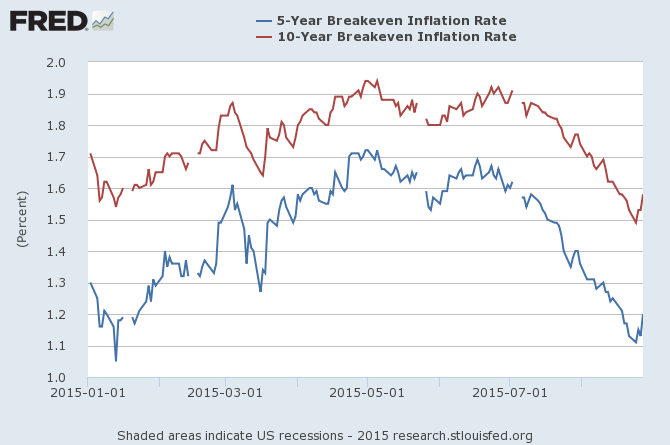 Quite interesting to see breakeven volatility with your own eyes, isn’t it? Last week was volatile for more than just stocks. Yes, you’re looking at almost a complete retracement from lows in January – buying treasuries just a few months apart made a tangible difference. As for what happens next? Your guess is as good as mine, so leave your guess in the comments! Even though we are headed into September, which is historically the worst month for stocks, the volatility is unnerving. I kind of welcome the market’s recent correction, since it has been headed up for quite a while. Hopefully, we will finish the year with a bang. As for the September Fed meeting, I wish they would just get on with it and hike the rate. The markets are up and inflation is down. Stop mamby-coddling Wall Street and set the rates somewhere near reality. Keeping them close to zero is a bad long-term strategy. It didn’t work for Japan and it’s killing retirees looking for fixed income. Another thing I’ve discussed offline: there’s no rule that says that during a hiking cycle, the rate has to be increased every meeting. We could, conceptually, see a slow increase cycle where we sit at .25% or .5% for some time.